When you watch a professional football game and witness the athleticism and competitive strength of its participants, the last words that might come to mind are “friendly” and “considerate.” However, when we’re discussing our beloved New England Patriots, those are the exact words Boston Medical Center uses to describe its hometown team. BMC has developed a very special relationship with the Super Bowl champions—one that started several years ago upon meeting former linebacker Jerod Mayo. Mayo and his wife Chantel began supporting BMC through their charity bowling event, Mayo Bowl. The annual occasion, which was founded by the Mayo family and Blue Sky Sports & Entertainment, attracts dozens of current and former Patriots players, including Tom Brady, Julian Edelman and Tedy Bruschi, to bowl strikes in support of BMC pediatrics. Mayo is so passionate about BMC’s mission, he has expanded his role through initiatives with Shake Shack and Flour Bakery, and most recently by joining the hospital’s Board of Trustees. “BMC is special because it cares for those who need it most, without discrimination. I have kids and I can’t imagine them not being able to receive the medical attention they need. It’s heartbreaking to see a child in pain, but BMC is doing everything it can to provide the best care possible,” he explains of his reasoning for supporting BMC. This past year, the Mayos stepped down from their Mayo Bowl hosting responsibilities, and passed the torch to fellow Patriot and running back James “Sweet Feet” White. White was launched into the spotlight overnight after his historic display in the 2017 Super Bowl, which clinched a Patriots victory. His performance broke the record for most catches in a Super Bowl game with 14 total, and his final carry was the game-winning touchdown in overtime. Over the summer, White toured Boston Medical Center, where he announced his participation with the event. The visit was quite a success, and put smiles on the faces of BMC’s pediatric patients. “Touring Boston Medical Center’s pediatric unit was deeply meaningful, and underscores why I’ve chosen to serve as this year’s host for the Mayo Bowl. For that reason, I look forward to be partnering with BMC on this exciting community event, which gives so much back to families in Greater Boston and beyond,” says White. In September, at the eighth annual Mayo Bowl, the hosting rights were officially given to White and Mayo addressed the crowd expressing his gratitude and excitement for the event to continue to make an impact and “go on to benefit those who are less fortunate.” To date, the Mayo family has raised more than $2 million for the hospital. Boston Medical Center was also excited to welcome a third Patriots player to its roster this fall—safety and two-time Super Bowl champ, Devin McCourty. McCourty added BMC as a benefactor of its annual Tackle Sickle Cell Casino Night event to support BMC’s nationally-recognized Center of Excellence in Sickle Cell Disease. Held in Downtown Boston, hundreds of guests enjoyed a lively evening of casino games, cocktails and socializing alongside their favorite Patriots players, including Dion Lewis, Dont’a Hightower and Duron Harmon. McCourty and his twin brother, Jason, have garnered significant funds through popular charity events to increase awareness and improve the treatment of sickle cell disease—a chronic, genetic blood disorder which causes painful attacks and fatigue that can be especially difficult for kids. This year’s casino night broke records, raising approximately $300,000 in support of its affiliated organizations. McCourty is no stranger to BMC however—he has been a regular participant of the Mayo Bowl over the years. His new partnership is an amazing opportunity for BMC to strengthen its relationship with the New England Patriots and continue to make a life-changing difference for its pediatric patients. Regardless of the avenue in which these Patriots players give back to Boston Medical Center, their commitment alone increases the hospital’s visibility and ability to care for the Greater Boston community. For New England dwellers, McCourty, White and Mayo are names you only affiliate with football, but for BMC providers and patients, these three are so much more—selfless heroes who happen to play professional football and win Super Bowls. 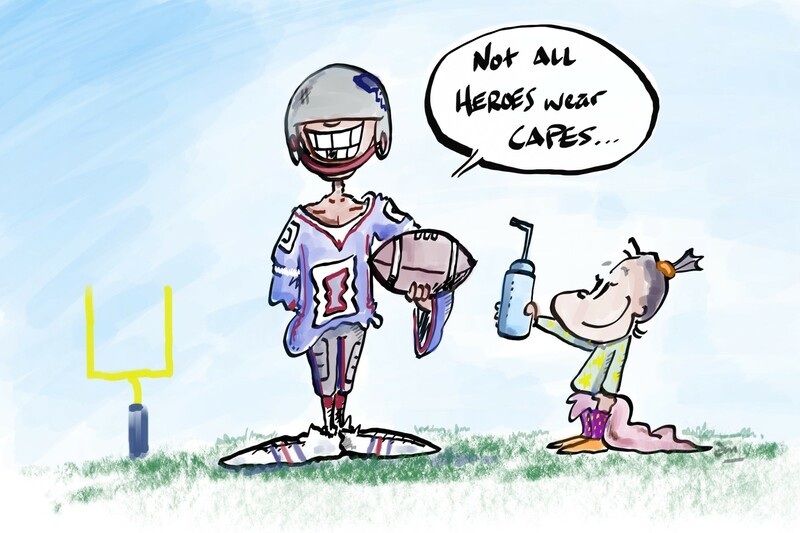 Illustration drawn by BMC’s very own, Jack Maypole, MD, pediatrician and director of the Comprehensive Care Program.